While shakshuka finds its origins in Tunisia, this dish of spicy tomatoes and poached eggs found a well-deserved, permanent place in the food traditions of Israel, where it even challenges hummus or falafel as the national favourite, and has recently been gaining popularity outside of Africa and the Middle East as well. While the Tunisian version features a variety of vegetables such as potatoes, fava beans, artichokes, and zucchini, the version popular in Israel focuses simply on onions, peppers, and tomatoes. In Tunisian, its name translates to “a mixture” or “shaken,” every cook in North Africa seems to have their own version, and there’s no end to the versatility of this dish. Like all countries in the Mediterranean basin, Tunisia offers a “sun cuisine,” based mainly on olive oil, spices, tomatoes, seafood and meat (primarily lamb). These foods all have great health benefits, and olive oil especially, as it’s known to reduce blood pressure and cholesterol levels. It also has anti-inflammatory properties, which helps ease arthritis, and reduces the risk of heart disease stroke, and cancer. In shakshuka, the benefits of olive oil are added to by the endless benefits of eggs, which are high in protein, contain all nine essential amino acids, are a good source of choline (which helps regulate the brain, nervous system, and cardiovascular system), are great for your eyes, and may also help prevent blood clots, stroke, and heart attacks. What’s more, the tomatoes in shakshuka are a good source of vitamins A, C, K, folate, and potassium, and have been linked to a reduced risk of several cancers, including throat, esophagus, stomach, colon, prostate, and ovarian cancer. This fantastically simple and healthy dish is budget-friendly, waistline-friendly, and no-time-to-cook friendly. While the presence of eggs may make people think of it as a breakfast dish, shakshuka is popular for any meal, and once the sauce is made, it only takes a few minutes to finish. 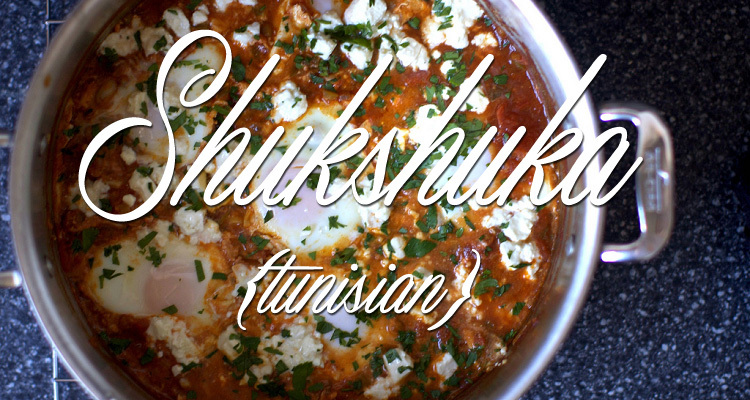 While being enjoyed, shakshuka is often accompanied by pita or crusty bread. Shakshuka is commonly made with harissa, which is a red pepper sauce that is used extensively in Tunisian cuisine both as a condiment and ingredient. The following shakshuka recipe doesn’t call for harissa, which may be difficult to obtain depending on where you live, but you can make it yourself with the recipe I’ve included at the end and put its versatility to the test. Crack eggs over sauce so that eggs are evenly distributed across sauce’s surface. Cover skillet and cook until yolks are just set, about 5 minutes. Using a spoon, baste the whites of the eggs with tomato mixture, being careful not to disturb the yolk. Sprinkle shakshuka with feta and parsley and serve with pitas. Place the peppers under a very hot broiler, turning occasionally for about 25 minutes, until blackened on the outside and completely soft. Transfer to bowl, cover with plastic wrap, and allow to cool. Peel the pepper and discard its skin and seeds. Heat the olive oil in a frying pan over medium heat, and fry the onion, garlic, and chiles for 10 to 12 minutes, until a dark smoky colour and almost caramelized. Now use a blender or food processor to blitz together all the paste ingredients until smooth, adding a little more oil if needed. 1Be very careful whenever handling hot peppers. Make sure to thoroughly wash your hands afterwards, and even then, you might not want to touch your face or eyes afterwards. Professional cooks usually use gloves when handling them. 2Cumin is a spice that’s common throughout the Middle East and India. It’s a source of magnesium, aids in digestion, and may even help prevent diabetes. 3Paprika (which simply means “pepper” in Hungarian) is a very popular spice that’s common in Spanish and Hungarian tradition. It’s extremely high in vitamin C and capsaicin, which gives that spicy taste to peppers. Capsaicin is a powerful anti-inflammatory, which helps ease arthritis and joint pain, and also improves blood circulation and aids digestion.